We always hear about the anxiety our kids with autism feel… but what about us parents? Jay is 10 now and really starting to come into his own. As he starts to understand himself , how to communicate his feelings and needs , my hopes for his future increase. I feel blessed because there is no doubt in my mind that one day, one day by boy will live on his own. My boy will go to college. My boy will not only get a job, he will most likely have a career. My boy will most likely marry and perhaps have children of his own. I know how lucky I am to be able to say that. Here is where my problem lies. As Jay gets older and tries desperately to express his independence, my anxiety gets worse. I know it should be the opposite.. but I can’t help but feel anxious. Should I stay or sho uld I go? Ahhh…the English Punk Rock band the Clash. They had one big hit that you may be familiar with. The song was called… “Should I Stay or Should I Go.” The song lyrics play over and over in my head like a broken record. This song is so true. If I leave him alone at a play date, well the odds are there will be trouble. He’ll loose at a game of chess and fall apart about it. He will decide suddenly he is done playing and without any explanation will walk into a different room to read a book. I know this because it has happened numerous times. But if I stay it will be double. If I am there, well Jay feels as if he does not have to try so hard. He will also take out his anger on me instead of the other child. I get it. With me he knows that no matter how he acts Mama will always love him. He can tantrum, meltdown, yell, flap, hum etc etc etc. Mama is there to redirect him, to hold him, to make sure he is safe. I am anxious to leave him because no one can make it better for my baby like I can. At least that is what I believe. And what about his friend, the person who has invited him over. Does this kid and his parents really have a clue how to handle my boy? Even if I brief them, tell them about his triggers, what strategies we use to get through the rough spots… is it fair to make them have to deal with that. It is much easier to have the play dates at my house. So we do. I make sure that there are plenty of snacks and fun things to do. I am there to referee, to explain his behavior, to make it all better. But if I don’t let him go to the other child’s house, eventually the invites will stop coming. The only way my son is going to grow, to learn , to understand how to be social is to be well… SOCIAL. So… should I stay or should I go? I still don’t know. I am still anxiously going round and round on that one. I certainly do hope I find the answer soon, because that song is driving me crazy! This post was submitted for the S-O-S Best of the Best series on Anxiety, which will be published on May 15th, 2011. For more information or to read other submissions click here. Oh my friend! I read this post and, of course, have tears running down my face. I am so fortunate to have a little girl who has no medical needs BUT after what she has gone through over the passed year and a half , she and Jay have very similar issues…. confusion, anger, tears, embarassment, not knowing who she is, not knowing how to deal with her emotions/loss, her world is upside down. Select words and images set off tears (me too). I am fortunate that the sleepovers she has are with very close friends of mine who can hug her, talk to her, and help her if she has a meltdown. My hope is that one day our babies’ skies will clear and they will be embraced and understood by their peers. One day, they will be able to cope with what life throws at them! Amen to that Emma. You should start your own blog… you write with so much emotion. It is beautiful! Seriously! It really helps to get it all out. It is like all the thoughts in your head are finally out there and you can actually analyze it. And other people can offer their opinions and support! You could help a lot of other women who are gong through the same thing you are. Seriously Emma do it! I would definitely be a follower! Love that song! I’ve been letting my Aspie son go more on his own this past year (well, more like pushing him at times). He wants his parents hanging around at social functions, like school parties, birthday parties, or his boy scout meetings. But being almost 11 with middle school soon approaching, we figure he needs to conquer some fears. Sometimes all goes well and sometimes he has an altercation, but it’s learning experience for him. As far as play dates/sleepovers, I’ve found that his behavior is usually great (he is polite, doesn’t argue or fuss) at someone else’s house (at least that is what the parents say), but it is worse when kids come to our house, maybe b/c it is his home turf and he is showing off more and trying to control everything. It is tough letting go, but ease into it slowly. Maybe dropping Jay off for an hour or two at another kid’s house before attempting a sleepover might help. That way he will get used to the environment/parents. Good luck! Love that song! I’ve been letting my Aspie son go more on his own this past year (well, more like pushing him at times). He wants his parents hanging around at social functions, like school parties, birthday parties, or his boy scout meetings. But being almost 11 with middle school soon approaching, we figure he needs to conquer some fears. Sometimes all goes well and sometimes he has an altercation, but it’s learning experience for him. As far as play dates/sleepovers, I’ve found that his behavior is actually great (he is polite, doesn’t argue or fuss much) at someone else’s house (at least that is what the parents say), but it is worse when kids come to our house, maybe b/c it is his home turf and he is showing off more and trying to control everything. It is tough letting go, but easing into it slowly helps. Maybe letting Jay stay at a friend’s house an hour or two before attempting a sleepover will work. Good luck! How do you decide. Bless your heart. I would have no idea what to do. Can you start out small? Perhaps leave him at a friend’s house and then go read a book in the park? Then return in 15 minutes. I don’t have kids, so I must admit I don’t have a clue. It was just an idea. This must be a crazy time for you. It really is the time when all kids are test-driving their independence, and when we are the most nervous about letting them do so. But also want them to be more independent so we can actually have a moment or two a day when we can actually be Not In Charge. 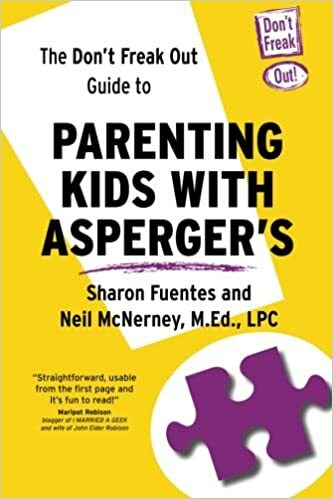 I hope it is ok to say this, though: when i’ve had kids over with special needs, I just want to know every trigger, sign of trouble, and comfort so I can make him/her more comfortable in my home. If someone invites him over and you’re not invited? That typically means the hostess is happy to have him over. I came by today from The Lightning & The Lightning-Bug linkup! Kim I don’t mind you saying what you did. The problem is that I don’t always know these people and honestly I can’t always tell you what will trigger him. That is the bad thing about Autism! Well one of the bad things… cause there are many. But there are soooooooooooooo many more good things too. Every day is an adventure, that is for sure. I am just so very grateful that my boy has friends. Not all autistic children do. What an interesting way to view the Clash! I think the concerns you have as a parent of a child on the spectrum can be similar to those felt of a lot of us first time parents as well. Trying to navigate the land of “too much” vs. “too little”. This is when instruction manuals would come in handy! For me personally, like Kim, I’d hope a parent w/a child w/special needs would share any and all info w/me to make their playdate a success. In the end, we all want the same thing right? Happy & social kids! Thank you for stopping by. I agree that too much and too little is something all parents face. Special needs mom, well me… I cannot speak for everyone else, are a bit more over protective. We spend so much of our day trying to prevent and remove triggers that can cause meltdowns… it is hard to turn that off and believe that someone else can do it just as well. I know they can though! Oh, Sharon, your courage and positiveness also inspires me. I loved that your hopes for Jay have only grown as the years pass. I love that he is doing so well. I’ve viewed “Should I Stay or Should I Go” with similar questions running through my mind. As a child, I had severe separation anxiety. Going to a friend’s house was terrifying for me…and sleeping over was nearly unheard of. I had dozens of meltdowns on dozens of trips to friends’ houses. I can remember sensing my parent’s frustration with me. They WANTED to give me independence to help me learn that it was okay…but unlike Jay, I only wanted them to stay. I remember being a much older child and still struggling with this fear and anxiety. A distinct memory is of me sitting at a friend’s house and singing “Should I Stay or Should I Go” over and over again in my head, trying to relieve some of my fear and alleviate that anxiety. And thank you so much for linking up with The Lightning and the Lightning Bug. I always love your posts! Thank you Katie for your kind words and for being so honest and sharing your story as well. I can only image how tough that had to be for you. I am so glad that you were able to survive that hard time in your life. You my friend are a lot stronger than you even know!